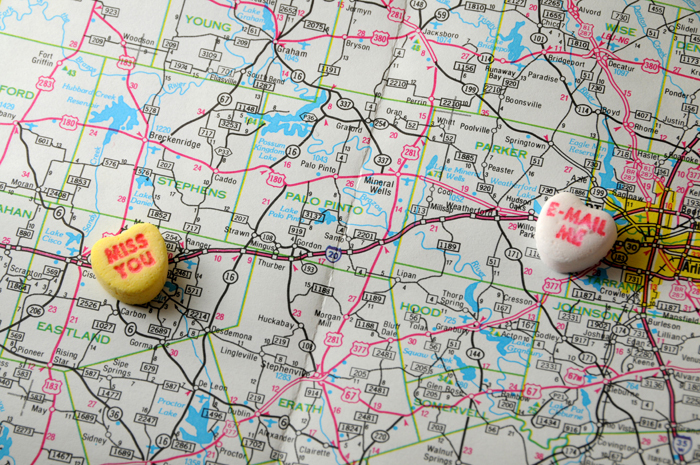 Sound advice Thursday: To Long Distance or Not to Long Distance? I’ve been dating a great guy for about six weeks. However, he is about to leave town for about a year, traveling around the country for his job. We really like each other, and he keeps telling me about his plans to come visit, and has requested that we keep talking, emailing, and texting — but with no labels or commitments — just keeping in close touch. I do want to keep in touch with him, but I’m worried that making these plans to visit and talking all the time will make it harder for me to move on. What would you do in my situation? This distance actually seems doable. Oh, the trauma of the modern dating world: everyone’s so gosh darn mobile these days, aren’t they? In the underrated 2010 movie Going the Distance, Drew Barrymore and Justin Long play a couple facing a similar dilemma to yours: they have been dating for six weeks (!) and have really fallen for each other, but for Drew’s career, she has to move across the country. They make the choice to try to hack it as a long distance couple, and – surprise! – it’s incredibly difficult. Given that it’s a romantic comedy, there’s eventually a happy ending. But in reality, long distance relationships (LDRs) often fail. My golden rule is that LDRs only work if and only if: 1) both people are really committed; and 2) there’s an end point in sight. What your beau is suggesting is not, in fact, a long distance relationship; rather, it’s long distance torture. He wants to keep talking – so that he’ll be perpetually on your mind, even though you can’t see him – but not make any commitment to each other. I can’t think of a worse idea, frankly. What, I ask, is the point of staying in touch with someone you really like when you’re not in a relationship with that person? It sounds heartbreaking, frustrating, crazy-making! I’m of the strict school on this, I’m afraid: I think you need to cut it off and save yourself a lot of heartache, my dear. If your romance with this chap is meant to be, when he ends up in the same place as you, then you can date and live happily ever after. But for now, if you’re not going to commit to each other, you both need to have the freedom to meet other people, which means not constantly speaking to one another and getting in one another’s bizniss. Think about it: if you meet another guy you like – someone who lives in your town – you might not even realize you like him if you’re still talking to the first guy. And how will you explain to the second guy that you’re in close correspondence with a dude you dated for six weeks but are not involved with anymore? Messy, messy. Keep it clean, and break things off. I’ll leave you with the words of the ever-wise Wayne Campbell: “I say hurl. If you blow chunks and she comes back, she’s yours. But if you spew and she bolts, then it was never meant to be.” Okay, maybe that advice is not dead-on, but you get the idea. Be strong, my friend! This entry was posted in Advice and tagged advice, dating, relationships on March 21, 2013 by Stephanie. AWESOME advice! Could not agree more…..